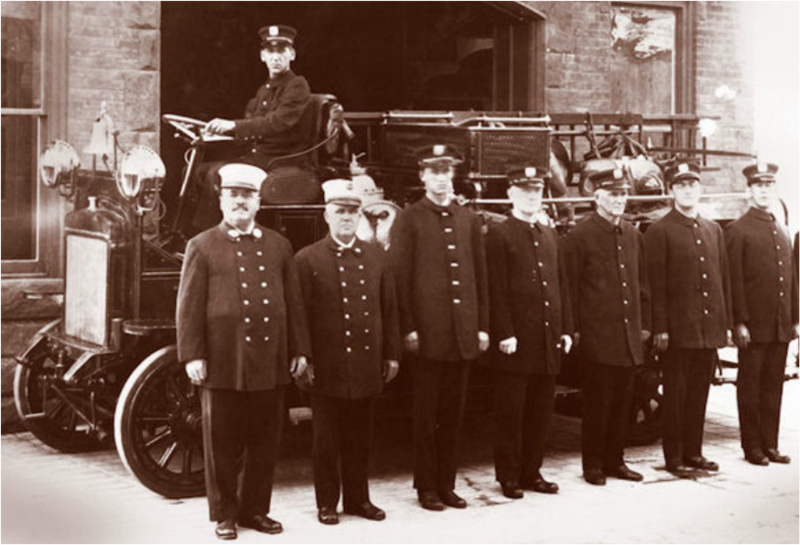 Of course horses propelled all Fire department vehicles from its establishment in 1890 until 1910 when motorization began with gasoline power chief gigs and Engine Company 10. This was followed by several steamers receiving gasoline powered tractors from Nott or Christie Front Drive companies. 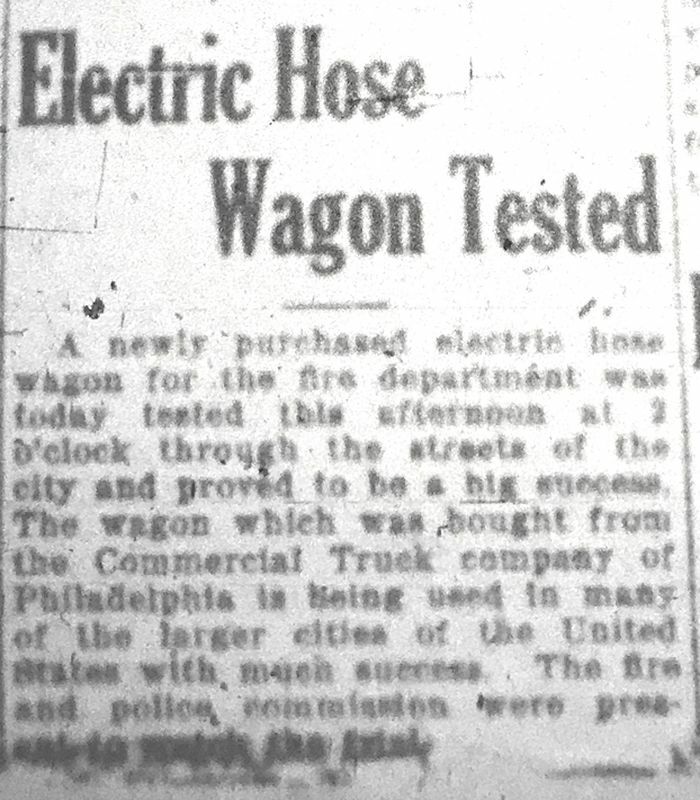 Start in 1917 the department under Chief Coyle starting transitioning to "electric" meaning battery powered apparatus. The following is an interesting discussion on this topic that is from the Edison Monthly in January 1921 (posted in 2008 at the Paterson Fire Journal blog site). A COMPLETELY motorized fire department — the largest in the state and one of the first in the country — is the source of a great deal of pride on the part of the citizens of Paterson, New Jersey. Additional interest is due to the fact that the motorization was accomplished through the conversion of horse-drawn trucks to automobiles, and further, that the apparatus is electrically driven. 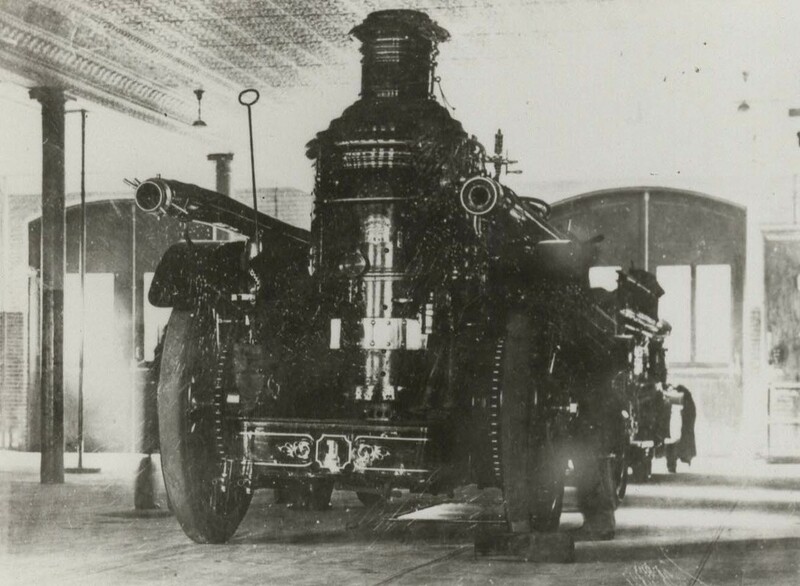 As a result of the changes Paterson now has speedy and dependable fire equipment, economy of operation is assured, because electrics can be operated at a lower cost than any other type; and because it was possible to convert horse vehicle into motors, the city avoided the waste of scrapping apparatus which though old, was still good for many years of service. The importance of adequate fire protection for a city of the industrial importance of this silk manufacturing centre, with its great mill districts, its large foreign population, its many hilly streets, and a residential district where the houses are, as a rule, of frame construction, need hardly be commented upon. 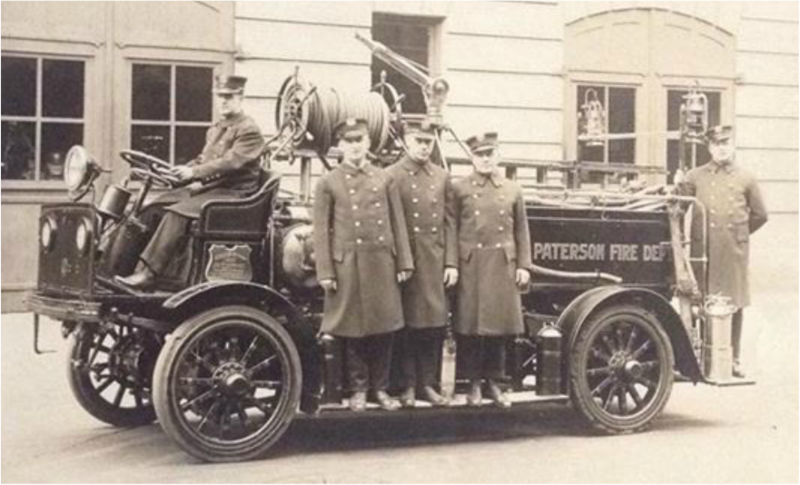 The Paterson Fire Department consists of fifteen companies and the electric apparatus includes nine engines, ten combination wagons, and three ladder trucks. These are stationed at strategic points throughout the city and the headquarters building is on Van Houten Street. The garage and repair shop of the department are on the ground floor of this building. Executive offices. dormitories, a social hall, and handball courts are on the upper floors. The headquarters building was erected after the installation of automobiles was decided upon and consequently was designed especially to provide garage facilities. The other buildings, however, were remodeled, the changes from stables to garages being made when the vehicles themselves were being rebuilt. The work consisted principally of installing equipment for charging the storage batteries and such machine shop facilities as were needed for making the routine adjustments to the fire apparatus. The charging outlets were suspended from the ceiling in such a way that two batteries could be charged from the same plug. The electrification of the Department began in 1917 after an unsatisfactory experience with gasoline drive. Five pieces of electrical apparatus were purchased from the Commercial Truck Company. These were Engine Number One and its Combination Wagon and Engine and Wagon Number Five and Truck Number Two. 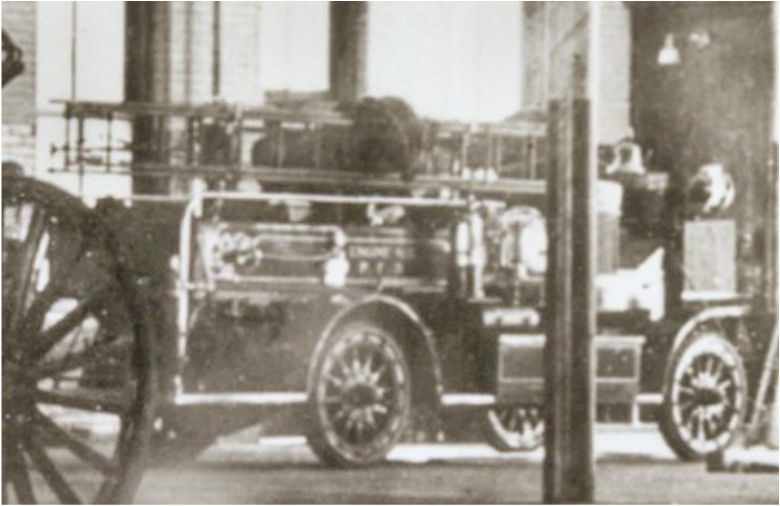 Standard fire fighting equipment was mounted on specially designed electric chassis and so satisfactory did they prove that complete electrification was decided upon. May 20, 1919: 3 apparatus (electric powered) ordered from Commercial Truck Company to replace 3 old Christie tractors. While the first pieces were built as electrics, the balance were converted by removing the gasoline drive then in use, and installing electric drive. Thus, much of the equipment, has undergone three revolutionary changes: as built originally it was drawn by horses; later gasoline tractors replaced the horses, and finally the electric motors and storage batteries were installed. The method of changing the apparatus was in itself interesting. In the case of the familiar engine, all the running gear forward of the gooseneck was removed, and channel beams, long enough and heavy enough to carry the storage batteries, the chauffeur's seat, and the driving and steering apparatus, were riveted on. The rear wheels, the boiler, and the pumping apparatus were not touched. 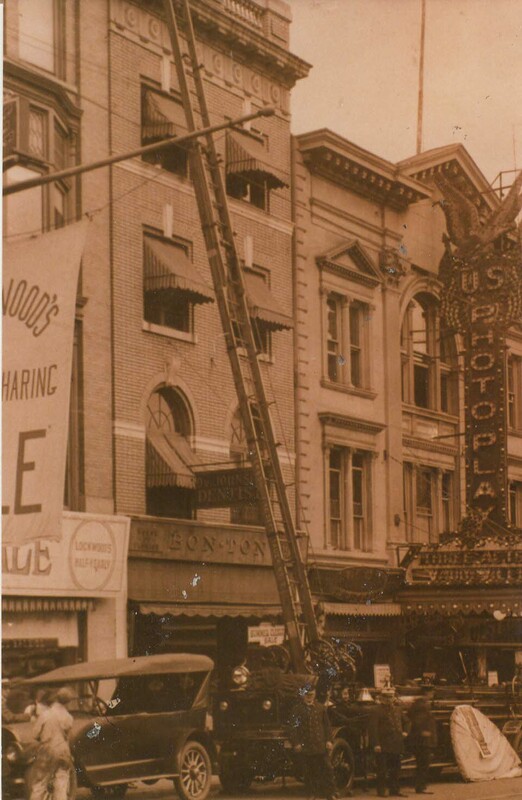 In changing the ladder trucks the frame was extended to provide place for the driving mechanism, the battery box was suspended under the frame and just forward of the rear wheels, and an entirely new set of wheels was mounted , each wheel having its individual motor. A similar lengthening and strengthening of the frame and the installation of motors for each of the rear wheels accomplished the same result for the combination wagons. Visitors to the New York Electrical Show of 1919 will recall the combination wagon which was exhibited. This was one of the Paterson vehicles and was on its way from Philadelphia, where the Commercial Truck Company had made the changes, when the Paterson officials consented to its stopping over in New York. By 1919, sixteen of the twenty-five pieces of apparatus had been changed to electric, and by the end of 1920 only three gasoline vehicles remained. The speed of electric apparatus in reaching fires is strikingly shown in the annual report of 1919, the last year for which complete figures are available. 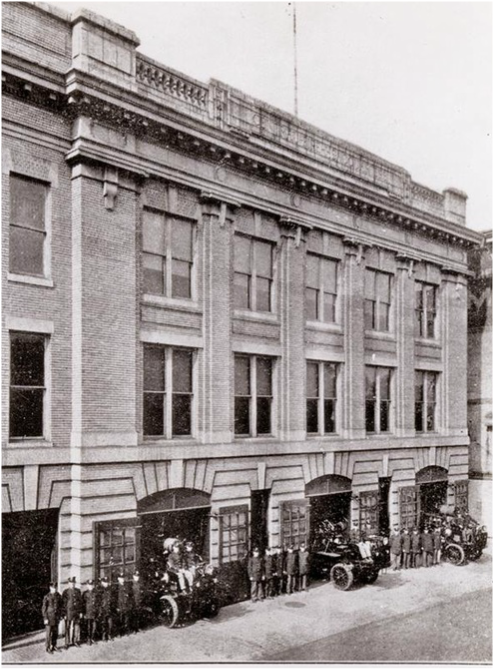 During 1919, the department responded to 511 alarms and reached the fires so promptly that in only four cases did the blaze extend beyond the original building. The damage in the most disastrous fire of the year amounted to only $209,000. The average loss in the next four fires was less than $50,000 while the average loss in all fires, including the big ones was less than $900. Trials designed to show the fitness of electric trucks for fire department work were conducted recently by Thomas Coyle, Chief of the Paterson Fire Department. One of the combination chemical trucks, weighing seven tons, was employed for the purpose, and heads of the fire departments of neighboring cities, including New York, as well as many of those interested in the electric vehicle industry, were present. 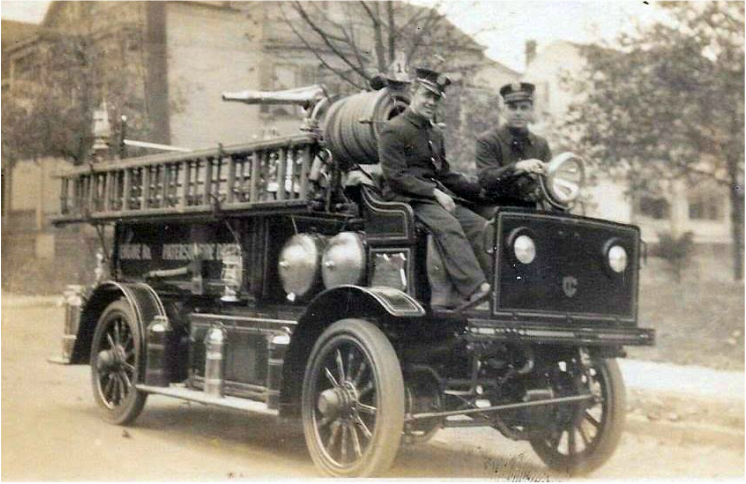 Engine 1 battery driven Metropolitan steamer in bay at 115 Van Houten Street. Hosw wagin in front. 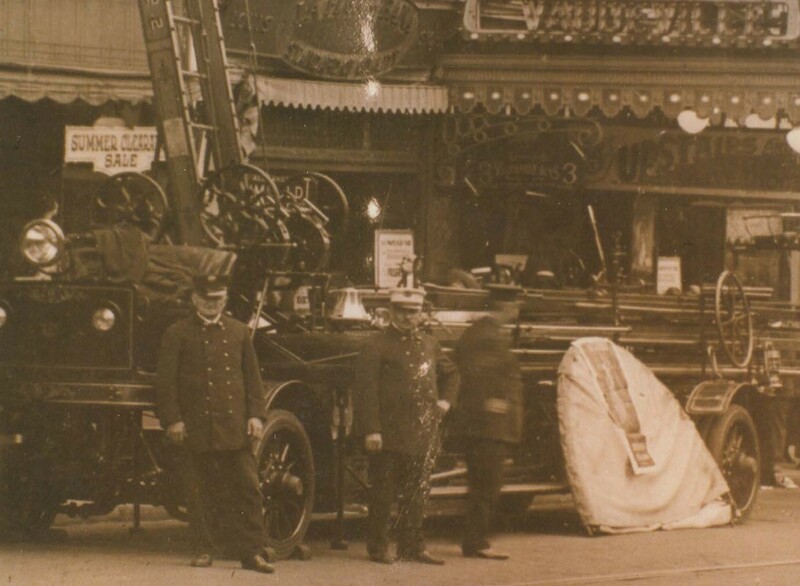 The first, on Temple Street, had a grade of fourteen per cent and was long but the truck climbed the distance in one minute and fifteen seconds. The second grade was the Cliff Street incline of seventeen per cent which was achieved in the running time of sixty-two seconds. Not only did the electric climb from a standing start, but it stopped in the middle of the hill and started again without any kind of assistance. The third attempt was made over the Haledon Avenue course of nine blocks with an eight per cent grade and the climb was completed in the astonishingly short time of two minutes and two seconds. A speed of thirty-four miles per hour was maintained on the level and at no time was any difficulty or hindrance experienced. In reply to a question regarding the ability of the electric trucks to proceed under adverse weather conditions Chief Coyle made the statement that "If electric trucks could not get through the winter snows nothing could" and that he and his associates believed that "the electric trucks are the most reliable, least expensive and best type of vehicle for fire department usage." Added to this testimony is that of Captain William H Ward who is in charge of the extensive workshop of the Central Fire Headquarters. Captain Ward said that the labors of his department had "decreased nearly seventy per cent since the introduction of electric trucks three years ago," and that "except when they smashed into trees, not one of the electrics has ever been out of service for as long as twenty-four hours." In fact there are now so few repairs called for, that Captain Ward has reduced his force of mechanics to one. Under this arrangement the Captain does practically all of the repair work on apparatus while his "force" has kept busy during the fall and winter repairing the roofs of the engine houses. Despite all the hype above. Paterson bailed pretty quickly on using electric apparatus. 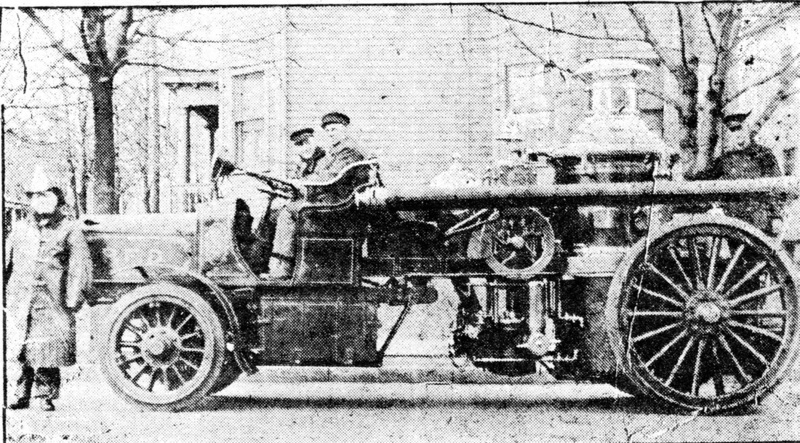 As soon as 1923 they bought a gasoline powered First Size American LaFrance Combination Hose Chemical and Pumping Engine for Engine Company 12 and between 1926 and 1931 replaced every battery powered apparatus with an Ahrens Fox gasoline powered pumper or aerial: exception was Engine 11 which received a used (from Haledon, NJ) American LaFrance gasoline pumper in 1932.